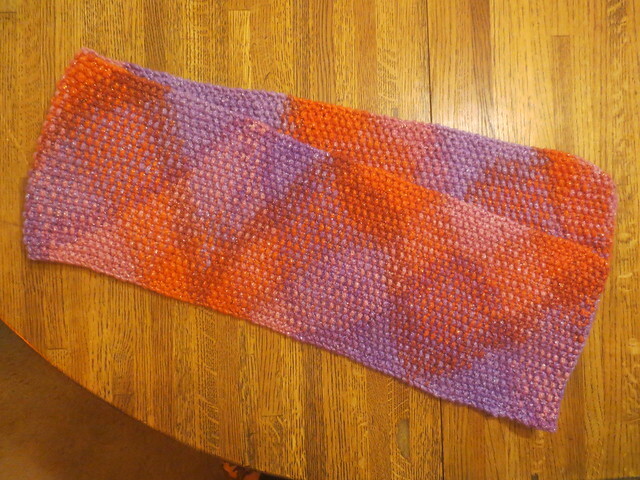 I finally finished an object, a scarf I started so long ago I couldn’t remember when that was. Thanks to Flickr, I could look it up. Apparently, it was about two years ago. Mid-February of 2016, I had three balls I’d wound by hand (because who knows where my ball winder was at that point, as we were about half moved from Michigan to Idaho) and a tiny strip of seed stitch scarf. 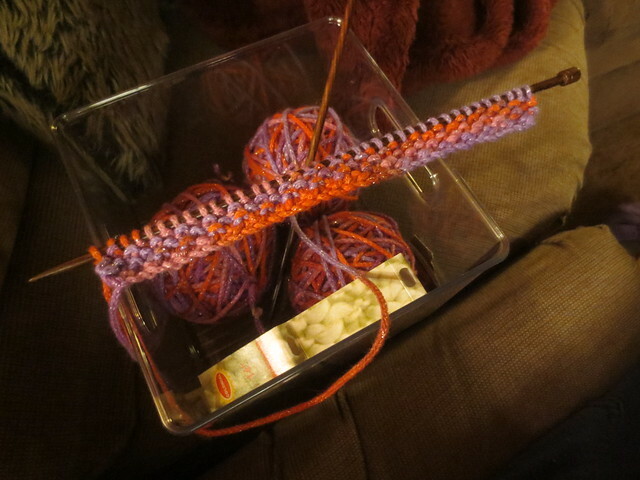 As of June of last year, I had about a third of a scarf, having not worked on it in over a year. Now I’ve got a whole scarf, which I would have had months sooner if I’d just gotten around to weaving the ends in promptly, but it was summer then and I didn’t need a scarf plus I had a family reunion to get ready for. I’ve already worn this twice; it goes nicely with my lilac fleece coat. It’s not quite as long as I’d like, but it’s as long as it could be given I only had the three skeins of yarn. On the plus side, it’s not as short as it would have been if I’d stuck with the initial width I cast on; an inch or so of that made me reconsider and rip out and start over with fewer stitches. I could have gone even less wide, I see now, but I still like it; it’s pretty colors and has a bit of flash from the silver thread in it, and living as far north as I do, I get a lot of use out of winter accessories. 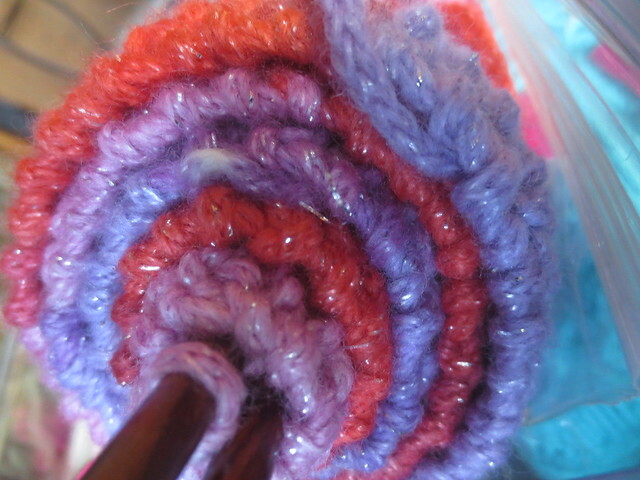 I love the triangle pattern that showed up – yarn, stitch, or a combo of both? 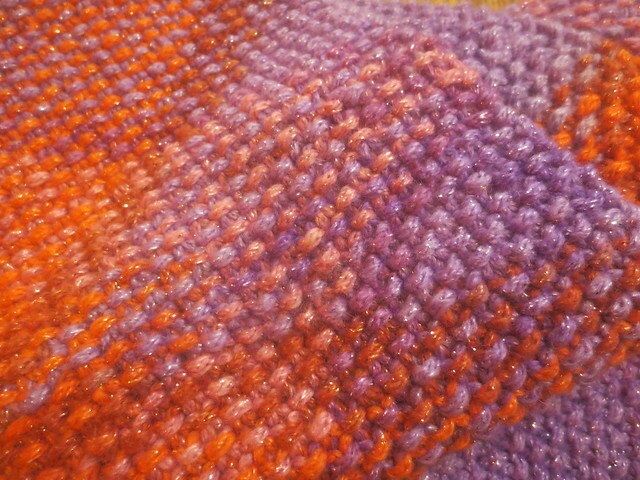 The pattern is mostly due to the yarn, though the width of the scarf certainly influenced how it turned out.